Pham Quynh was one of the leading monarchists of the late Nguyen Dynasty era of Vietnam and an outspoken supporter of adhering to traditional Vietnamese customs in the establishment of a constitutional monarchy. He was born on December 17, 1892 near Hanoi and was orphaned at a young age. Nevertheless, he was extremely bright and showed great talent as a writer and earned a scholarship at the age of 16 to attend the prestigious Ecole Française d’Extrême-Orient in Hanoi. He became a journalist after graduation and soon became prominent as one of the leaders of two distinct schools of thought regarding how to deal with French colonial rule in Indochina during a time of rising revolutionary fervor. 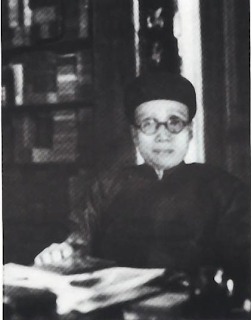 Pham Quynh was faithful to the monarchy, absolutely, but also supported the French protectorate and argued that social progress and moral development could best be achieved by carefully combining the best ideas of east and west, such as western scientific knowledge and the moral wisdom of the Confucian value system. Although he saw no need for conflict between the traditional imperial system and the place of Vietnam in the global French colonial community, Pham Quynh recognized the tensions that did exist and called for a more strict interpretation of the protectorate treaty and a closer adherence, on the part of France, to the agreements they had signed with past Vietnamese monarchs. For Pham Quynh this would mean a more central and authoritative role for the Emperor of Vietnam who, over the years, had become more and more marginalized. His opposite number was Nguyen Van Vinh who was very pro-French and adamantly opposed to the traditional Vietnamese monarchy. It was his desire that France take even more direct control and import the ideas and values of the French Revolution to Vietnam. Pham Quynh, of course, was opposed to this even though he felt France had much to offer his country and he wished to remain on friendly terms with France and for Vietnam (and the rest of Indochina) to remain within the French community. 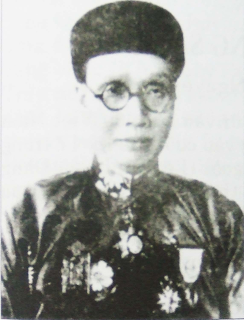 In 1917 Pham Quynh founded the journal “Nam Phong” (Southern Wind) with the assistance of the French colonial authorities. With this as his vehicle he wrote eloquently and frequently about his ideas for a revived Vietnamese monarchy as well as engaging in a war of words with Nguyen Van Vinh and those of his point of view. His prestige grew until he was regarded as the most gifted writer and eloquent defender of the imperial system of his time. 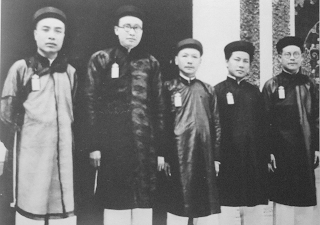 His reputation was such that, in 1932, when Emperor Bao Dai at long last returned to Vietnam from France to take up his royal duties he appointed Pham Quynh to his new government. Along with the monarchy itself, Pham Quynh was one of a shrinking number of intellectuals who defended the role of the mandarins. While recognizing that some reform of the system was called for, he argued that the mandarins were necessary, that they had always been an instrumental part of Vietnamese government and could continue to be of value in the French protectorate. He was also less than pleased with the divisions France had imposed on the country and overall argued for a return to a more traditional system, such as Vietnam employed before the arrival of the French, which had worked for over a thousand years and could still be useful in their own time. Some of the colonial authorities may have been alarmed at some of his conclusions. With an Emperor who would actually be allowed to exercise his authority, and a revived system of mandarins to administer justice, Pham Quynh argued that the ultimate end of his proposed system would be nothing less that total Vietnamese self-government. Yet, he stressed that this did not need to be in contradiction to the protectorate. Let France protect Vietnam on the world stage but let the Vietnamese govern themselves in the traditional way they knew best. The French could “advise” and “direct” the imperial government in Hue but it was the Emperor who must be the source of true authority in the country. In one of his articles, Pham Quynh wrote that, “Changing the political [system] of a country is like curing a sick person; however weak the patient may be, he still has organs. If you want the sick person to be well again, all you have to do is … restore his strength and vigor; but if you try to replace all the organs, then it is not only useless, it is life-threatening.” He tended to blame the French colonial system for diminishing the credibility of the monarchy and always emphasized what he termed as a “loyal application” of the protectorate agreement. However, the French did not object to his writings and, given his long career they could be seen as at least passively supportive of them. 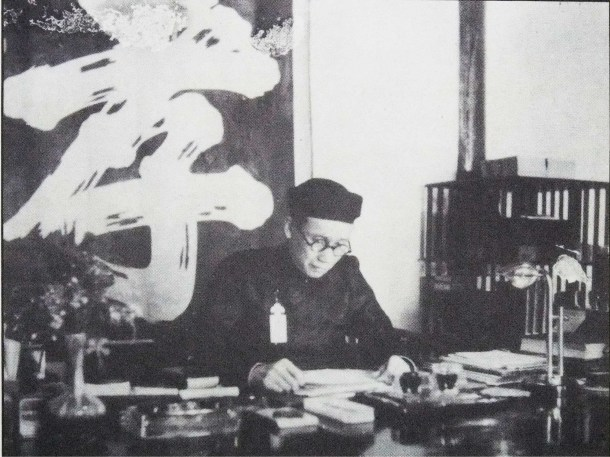 He hoped to be in a position to help put his ideas into effect following the return of Emperor Bao Dai, especially after the so-called “Coup of 1933” when the Emperor dismissed his older, more traditional ministers, and appointed a new crop of young, more nationalist-minded officials such as Bui Bang Doan, Minister of Justice; Ho Dac Khai, Minister of Finance and Social Assistance; Ngo Dinh Diem, Minister of the Interior and Pham Quynh who was appointed Minister of Education and chief of the cabinet after having already been made Director of the Imperial Cabinet, which position he continued to hold. The only man to retain his post from before the shakeup was Thai Van Toan, Minister of Rites, who had been the personal secretary of the Emperor’s father, Emperor Khai Dinh. Because of his reputation for being well-spoken and respectful toward tradition, Pham Quynh was often called on to perform duties outside the confines of his office, such as when he was sent to explain the new changes to the grand old ladies of the court (wives of previous emperors) and to, tactfully, explain to them that their influence in politics would not continue. The new government did not last long as what most regard as the pivotal moment was the resignation of Ngo Dinh Diem, frustrated by what he saw as continued French interference in local affairs, in violation of the protectorate treaty. However, this may have actually been the result of a proxy conflict between Pham Quynh and the venerable Catholic courtier and “old guard” conservative Nguyen Huu Bai (a great man in his own right), who had taken on Diem as a protégé. Nguyen Huu Bai and Pham Quynh actually had much in common, both being totally loyal to the monarchy and both advocating a stricter interpretation of the protectorate. However, Nguyen Huu Bai tended to view Pham Quynh as a parvenu, someone advanced above his station in society and a bit too modern-minded. Ngo Dinh Diem carried on the conflict on behalf of his mentor and also, being from an old, well established court family, resented the rapid rise of Pham Quynh from journalist to imperial minister. Despite these intrigues, Pham Quynh was an extremely hard-working official and his ministry was one of the most active in the new government, producing more than twice as many acts as any other. He was also vocal in calling for greater unity between northern Vietnam and the Imperial Court in Hue, which put off some of the French officials who could point to republican Vietnamese (like Nguyen Van Vinh) who wanted the north (Tonkin) to be a separate colony directly under French administration. Ultimately, the refusal of the colonial authorities to delegate any real authority to the monarchy disheartened many royalists who had been friendly toward the French, turning many into revolutionaries opposed to both their native monarchy and the French colonial empire. For all of these, in many ways, Pham Quynh was seen as their primary archenemy. Although not seen as outrageous at the time, many have since also criticized Pham Quynh for his actions during World War II, specifically his enthusiastic praise for the regime at Vichy of Marshal of France Philippe Petain. Pham Quynh found the monarchist Charles Maurras a much better example of the shared values with Vietnamese Confucianism than the previous republican admirers of the Revolution. 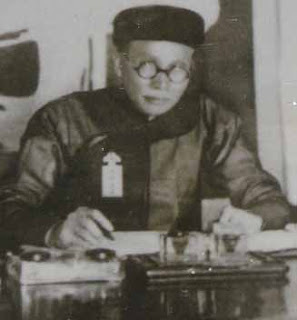 Pham Quynh wrote and spoke at length about the similarity in values between traditional Vietnam and the “labor, family, country” emphasis of the Petain government. Again, many other Vietnamese conservatives at the time did the same but, after the war, this allowed many French to regard Pham Quynh as a “collaborator” just as the revolutionaries among his own countrymen regarded him as a “collaborator” for accepting French colonial rule as a fact of life. Pham Quynh went further and said that recent events had proven the republican system in France to be a failure and that under Marshal Petain the French were rediscovering their “soul” and that Vietnam should do the same by renewed emphasis on the monarchy, the mandarins and the traditional Confucian value system. At one point Pham Quynh even gave a lecture on the parallels between Confucius and Charles Maurras. In May 1942 Pham Quynh was promoted to the position of Minister of the Interior, a sign that, with the change in government in France, hopes were rising that his views were becoming more acceptable to the colonial authorities and the Emperor might be given a more active role in the government of his country. 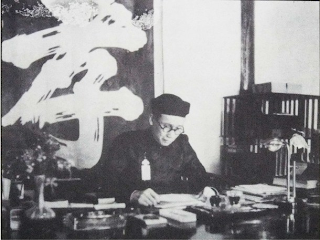 However, as his prestige grew, so did the opposition against him and in 1945 when, with Japanese support, the Emperor declared the independence of the “Empire of Vietnam” Pham Quynh resigned his post. The Emperor had wanted Pham Quynh, alone among his ministers, to stay in office and even become prime minister but the court opposition to him was too great and for the sake of the success of this hastily declared independent empire, he bowed out and the job ultimately went to Tran Trong Kim. In any event, the empire did not last long, tied as it was to the fortunes of Japan, and it was swept away with the “August Revolution” led by the communist-dominated VietMinh. On August 23, Pham Quynh was arrested by the VietMinh and sent to a labor camp. Less than a month later, on September 6, 1945 he was murdered by the communists along with Ngo Dinh Khoi and his son Ngo Dinh Huan. In 1956 his remains were recovered and he was given a proper burial. Even in his last days the French had included his name on a list of officials to help in restoring the French position in Vietnam as part of a constitutional monarchy under the former Emperor (who had abdicated to the VietMinh in 1945) known as the “Bao Dai Solution”. Naturally, this only made him even more despised by the communists as Pham Quynh represented what they hated most; loyalty to the Emperor, friendship with France and a more traditional plan for Vietnamese unity and self-government. Today, of course, the memory of Pham Quynh is still vilified in Vietnam under the Communist Party but he deserves recognition for his steadfast loyalty to his monarch, his intelligence and great ability as a writer, able to adapt ancient values to fit the needs of his time. He made a great contribution in presenting an alternative to radical, republican revolution and in how the traditional values and government structure of East Asia could still serve them well in the modern world. It is unfortunate that there were not more of his quality.